So Cool You'll Wet Yourself! This easy-to-use set includes detailed, step-by-step instructions, tips and techniques for creating bodies of water. 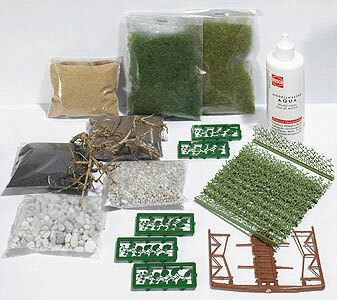 Includes 3-3/4oz (125ml) Aqua water material, several colors of quartz sand to make stream and lake beds, stones for the shore, wild grass fiber, reed and lake rose leaves for the bank formation, a wood bridge and driftwood. Copy this Complete Water Set to your MY ACCESSORIES roster.